Had a wonderful night walking around in Bukit Bintang area. Main purpose: to get a new flip flop. The old one makes me slipped for times in this 3 years. White with color polka dots. the stall of roasted duck rice was closed before we manage to grab one. Better luck for next time, I yearn to try the roasted duck. They do have savory scent. Here comes the Pavillion's Chinese New Year deco. 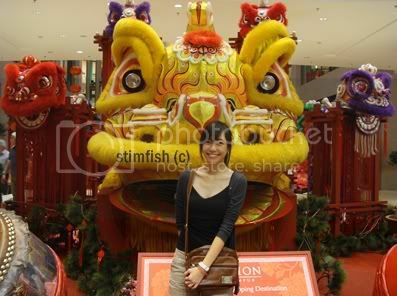 Did you see the purple lion-dance? Health, Wealth, Prosperity and Peace. Beat the drum in order to get your wish in this rabbit year. We beat all, and hoping for the great fortune. haha, then you become shopaholic again a?